H x W: 28 in. / 41 in. 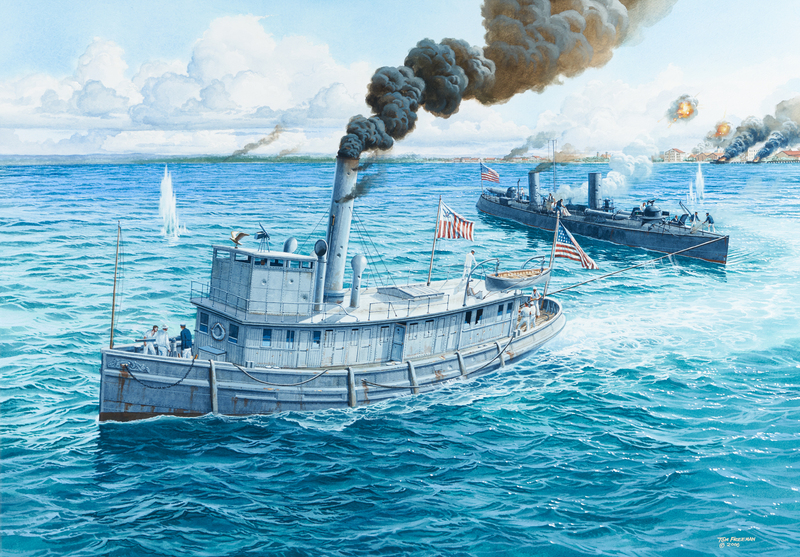 USRC Hudson provides aid to the USS Winslow from Cardenas Harbor, Cuba, May 11, 1898, at the Battle of Cardenas Bay. The cutter Hudson, U.S. Navy ship Winslow, and three other U.S. Navy warships pursued Spanish gunboats into the bay. Enemy shore batteries totally disabled the Winslow. Under intense enemy fire Hudson towed the disabled Winslow out of danger. The United States Revenue Cutter Service (USRCS) was established by Congress in 1790 to serve as an armed customs enforcement service. It was merged by Congress with the United States Life-Saving Service in 1915 to form the United States Coast Guard.